For the first time in four years, BU was victorious at Battle on the Border. BRANDON, MB – An imaginary line between countries served as a starting point as seventy students ran full force to grab one of the precious dodge-balls that lie in wait. 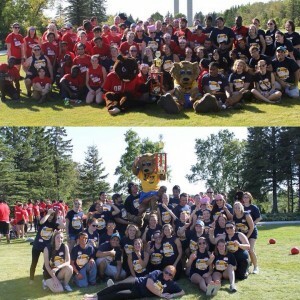 The 4th annual Battle on the Border pitted students from Brandon University (BU) against Minot State University (MSU) in an afternoon of friendly dodge-ball this past Saturday at the International Peace Gardens, located between Manitoba and North Dakota. “This event is all about fun, tradition and team-building,” said BU’s Director of Student Recruitment and Retention, Katie Gross. Both universities fielded teams of 35 players, with some international students coming from as far away as Norway, Russia and China. Recently identified as one of Canada’s best campus traditions by University Affairs, Battle on the Border has become an anticipated highlight of BU’s return-to-classes fall orientation activities. For the first time in four years, BU was victorious. 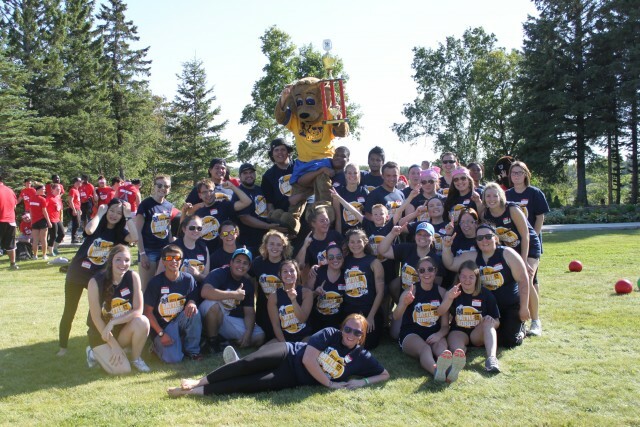 With the last dodge-ball thrown, the BU team erupted with joyous yells as they ran onto the field with the trophy in hand while raising Bailey the Bobcat (BU’s mascot) onto their shoulders. “It’s about the smiles, new friends and memories we take home with us, but it was also nice to be on the first BU team to win,” said BU Archaeology student, Kristin Smart.